Today I can't come up with any idea to write, so I'll show my favorite stuff. "MUJIRUSHI-RYOHIN" is one of my favorite brands since I was a teenager. I didn't go there in my twenties, but recently, I drop by the shop from time to time and choose some sweets and stationery. 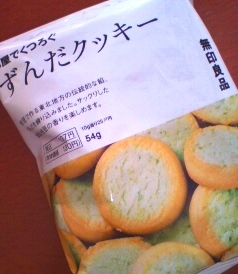 This cookie is made of green soybeans, and looks so cute. Honestly, this bag of cookies is a little small, so I don't think it's reasonable to buy. When I was younger, "MUJI" sold cheaper ones with simple package, but now "MUJI" has become a kind of brand-name shop and sells with a bit higher prices. Hmm. However, there are many kinds of stuff available and its design is really cute. I've heard that MUJI has invited some famous designers and produces stuff with good design. That's why it costs higher, I think. There are some other sweets I've bought, so I'll write about it soon.